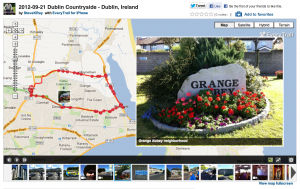 My hike through the outskirts of Dublin before the group arrived. With an interactive map, videos and pictures you can join me on the leisurely hike through some beautiful countryside. Ireland is a remarkably Catholic country that has overcome every obstacle and oppression. The people are generous of heart and friendly, the country beautiful, green and rich with history. PART TWO: Arrival in Galway, exploring the city, settling in to hotel, welcome dinner and well deserved rest in preparation for a busy day tomorrow including visiting the Shrine of Knock.